This is 4 year old Diesel. Diesel is looking for a home that is experienced with mastiff breeds and their stubborn personalities 🙂 Diesel is extremely loving once he trusts people and will fall to the floor for a belly rub. He doesnt like being grabbed by the collar and will mouth to get away from the grip but he is absolutely fine on lead. Diesel really needs routine. In kennels he has settled well with a routine of feeding and exercise. This handsome strapping boy can live with a female dog and has lived with other dogs in the past. 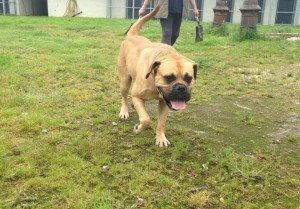 Diesel will not be homed with children. He needs a home that is very firm but also very fair. He will thrive with rules and knowing just what is expected of him and with a routine in place like all dogs. One on one will give this boy the good life he so deserves. Diesel is currently in North lincolnshire. He also needs a foster home to get him out of the kennel environment until his forever home comes along.